Gboard is a new keyboard which is launched by the Google and available on Google Play Store. It is a great keyboard which allows for GIFs, emoji, Glide Typing, Voice Typing and many more. 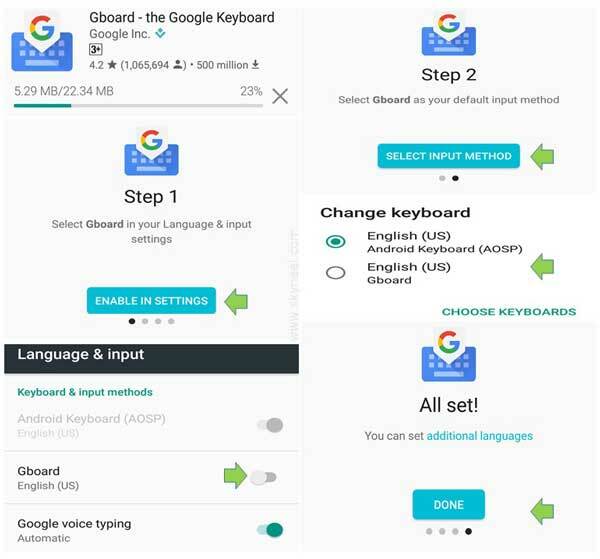 This guide helps you about the Gboard a new keyboard launched from Google and available on App Store. Gboard app is free to download app which is available on the Google Play Store. Gboard allows you to switching, searching, sharing from your keyboard. You can easily quick find required emoji, GIF searching as well as multilingual typing which lets you to switch languages on the fly. You can easily fix different bugs and improve the performances, search your specific query to Google’s web servers and provide the results. Gboard remember all those words which you type, it helps you with spelling and searching purpose on your device. The Gboard is a new keyboard which is launched by Google . You can use Gboard for searching emoji, GIF search, Glide typing, Voice search and many more. You can search and share nearby stores and restaurants, images, videos, weather forecasting, news, sport score and others. Gboard is taking 22.34 MB space on your smartphone. You just have to take few simple steps to use Gboard on your smartphone. Step 1: Download and install Gboard from Google Play Store. Step 2: Tap on the Gboard app to open this app. Select Gboard in your language and input the settings. You can do this job by tapping on the “Enable in settings” button. Turn on Gboard option in “Language & input” dialog box. Step 3: Select Gboard as your default input method. Set or change the keyboard “English (US) Gboard” at the place of “English (US) Android Keyboard (AOSP)”. Step 4: For betting typing suggestion you have to grant the following permissions to Gboard contact list by tapping on “Set Permissions” button. Turn on “Allow” button to access your contacts. Step 5: Finally tap on the “Done” button to finish the process. Gboard is free to download an interesting and useful app which is already downloaded by 500 million users and they gives 4.2 user ratings of this app. The Gboard a new keyboard launched from Google and available on Google Play Store. You can use this Gboard keyboard on your smartphone and get the benefit of this app. If you have any suggestion regarding this article, please write us in the comment box. Thanks to all. thank you so much for this update , many many thanks……………………………………..